So, I have an idea. Now where do I start? Often a lot of ideas do not get implemented because the person with the idea just does not know what to do to get transform the idea from a concept to a product or service. Often the number of things that need to get done seem daunting, or complicated or just too time consuming. My suggestion to aspiring entrepreneurs is to first relax and break down the things to do into easy to understand and easy to manage steps, and prioritize them. Often just listing down things to do will help you plan the activities in a manner that seems practical and doable. Validate the idea i.e. 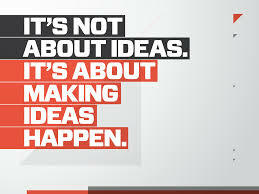 check with others whether the idea is as exciting to them as it is to you. If others do not think it is as great as you imagined it to be, either do a real hard think of whether you are a visionary that sees the potential in things that others are not able to see, or is the idea really not as good as you thought it to be. Often many ideas fail to pass this test, and even if it fails the test, it saves you a lot of time in planning around something that may not have worked in the marketplace. Quantify the idea: If the idea does seem to be exciting, do some basic research to understand the potential. E.g. if you are thinking of doing ‘healthy packed breakfast for office goers’, you could call up 20 friends and ask them if they would buy it, and if they would how often and how much they would pay for it. One you get a feel of this being interesting to a fair number of people, you could ask a few students (or your kids or nephews/nieces) to do a quick research for you – contact about 200 – 500 people and give them a simple questionnaire – something that can be done in about 2-3 minutes per person. This can give you quantitative data e.g. 25% of all respondents said they will buy, but 48% of people in the higher income category said they would buy. Within them, 65% of families where both husband and wife were working said they would buy. Now, this gives you data that you can apply to your locality and make some assumptions. E.g. In the colony that I live in, which is where I will want to pilot test this project, there are approximately 5000 apartments. If I assume that 20% of them are families where the husband and wife both working, we get 1000 households to target. Of these, if I am able to reach 50% through leaflets, etc., I can have an audience of 500 families. And as per research if 65% of them buy, then I have a potential of 300+ families just in my locality. Think of the larger potential: Once you quantify for a smaller scale, think of what the larger potential could be. E.g. in our example of the ‘healthy packed breakfast’ business, do some research on how many double income families in the higher income category are there in the city. Then how many are there in the top 4 cities. Then how many are there in the top 10 cities. This give you a view of how large the business can be. YOU DO NOT HAVE TO DO IT AT LARGE SCALE IF YOU DO NOT WANT TO. But understanding how big it can be often pushes you to give it a good try at a smaller scale. Think of the ‘HOW’ part: I.e. think of the implementation. ‘See the film in your mind’ of how this can be done. What resources will you require, what kind of and how many staff you will require, etc. Spend a lot of time detailing out the operational aspects. The better and more detailed you do this, the sharper your plans and more in-control you will feel. Work out the business case: Planning the operations will give you a view of the costs for doing the business. First work out the costs per unit and add the margin or profits you could have. See if the pricing with the profits works out to be a reasonable figure. If it does, then work out the total costs and total revenues for a pilot project, then for a larger area and gradually scale it to a larger size. You could take the help of someone who understands numbers better to get this financial model done. It need not be a complex sheet. It has to give you broad indicators on whether there is money to be made. Think creatively about marketing and outreach: Think of ideas of how to reach people. And what your brand’s personality could be. Hire a small ad firm or design agency to develop your communication. Be creative. Innovate. Plan the launch: Work out the details on when and how you will launch. Work backwards from the launch date. Plan everything well. Assume more time than you initially budget. Keep buffers for everything. Do small tests: Test all systems – do a free trial run. See what worked and what needs change. And change it. Reassess and review: Take feedback. See what is working. Constantly keep changing. This article was originally published in the Sheroes Community on May 12th 2014. Read the article here. Having called myself an entrepreneur for quite some time now, and to have believed so too (well to some extent! ), the title threw me off grounds right away…..I could go over the entire rigmarole of the “Ideation”-to-“Launch” a zillion times, if only I had my stake of capital to attract and interest serious investors is also what rings on my mind…..! An after thought, I do earnestly believe that if you got it going for a smooth take-off right away and instantly, then I guess it wouldn’t be termed an “Entrepreneurial” success, would it?! Previous Previous post: What questions should entrepreneurs ask an angel investor to determine if there is a potential fit? Next Next post: Flipkart acquires Myntra – what’s the deal?